Busy B Family: Water fun and sleepovers! The kids have been having lots of fun playing in the water the last few (hot!) days. 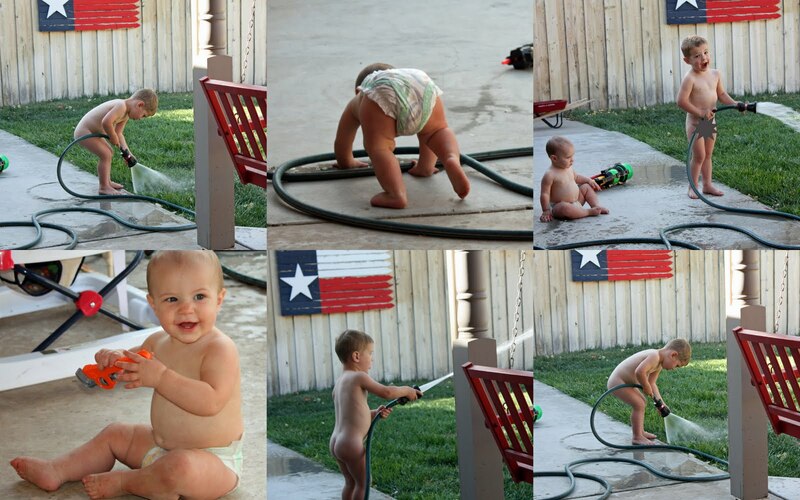 Landry is really loving Chris' "fire hose" nozzle on the water hose, so that has provided hours of endless fun! Monday nite the boys stayed with us, so of course they all played outside. This was Landry's first official sleepover! They've stayed with us before but this time Landry got to sleep on a pallet in the living room with them! He had a great time! Although Tuesday at MDO, he did sleep majority of the day! Chris had Tuesday off from the station, so him and the boys tore down and put up all new sheetrock in the garage. The boys were so excited that Chris bought them new gloves and they got to actually work and not just play. Keevan had to measure the rock, Chris would cut it and then both Keevan and Kaleb would screw it up to the wall. It looks so much better already! I was shocked at the difference. Needless to say, they wanted to stay the nite last nite too. Instead of just playing in the water though, they soaked the sand with water and played in the mud. I don't know if I've ever seen 3 boys so dirty. It took a wash down outside, 2 baths and a shower to get them clean! They all had a blast though! I definitely see more sleepovers in our near future! It sure looks like everyone was having a good time!! I have heard of mud baths before but never seen one. Ansley was sure being entertained by a bunch of good looking boys. Hope they helped clean up. They sure were enjoying fixing the garage walls.